Captain James Bulloch purchased the Sea King and the Laurel and used them both to transform the Sea King into an armed cruiser to use against Union shipping. 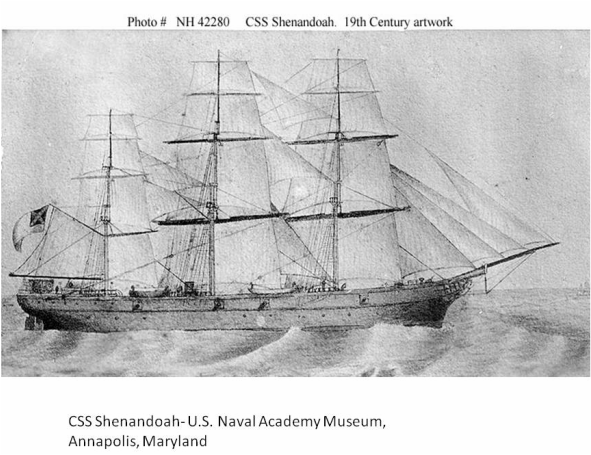 The CSS Shenandoah was the first Confederate ship to travel around the world, the last to fire a shot in the Civil War and the last Confederate cruiser to escape the surveillance of the neutral governments of Europe. A Stephen & Sons built the Shenandoah as the Sea King in Glasgow, Scotland in their River Clyde shipyard and she was launched on August 17, 1863. The Sea King was designed to be a British troop transport, built with iron framing, teak planking and featuring sails and an auxiliary steam engine for power. Confederate agent James Bulloch had noticed the new ship at anchor and made plans to acquire her to use as a commerce raider. United States agent Thomas Dudley had alerted Ambassador Charles Francis Adams about Bulloch’s intentions. United States Secretary of State William Seward had warned the British government several times about allowing the Confederates to purchase ships and weapons, and Bulloch had to operate in secrecy to avoid both American and British authorities. In September 1864, the Confederate government purchased the Sea King to use as an armed cruiser against Union merchant shipping. Captain Bulloch also purchased a tender Laurel, and using several secret operations and covers, he purchased provisions to prepare for a long sea voyage. On October 1, 1864, Commodore Samuel Barron, the senior Confederate officer in Europe, sent orders from his Paris office to more than 20 Confederate naval officers in England and France. The orders said to go immediately to Liverpool and report to Captain James D. Bulloch, the Confederate naval agent there. John Thomson Mason who would become a midshipman on the Shenandoah, was one of the Confederate naval officers who reported to Captain Bulloch in Liverpool. His orders told him to assemble an outfit for a two year cruise as quickly as possible, pack his turnks in wooden cases so they would look like ordinary merchandise, and sent them on board the steamer Laurel at Clarence Basin. On October 8, 1864, 23 officers and about 12 picked men who were the remnants of the crew of the Alabama, boarded the tug Black Hawk, were carried on board the Laurel, and before daylight the next morning the Laurel had weighed anchor and put out to sea. 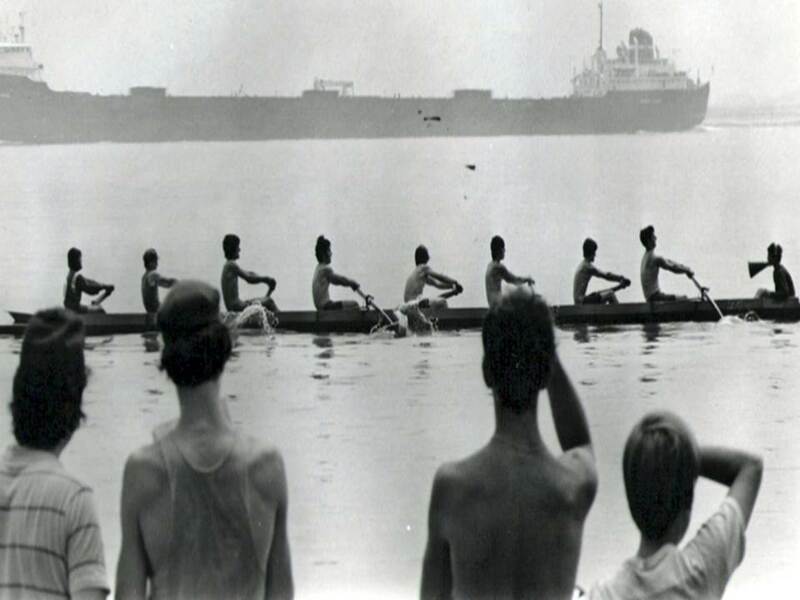 A few days later, the Laurel arrived in the Madeira Islands. As soon as the Sea King had cleared English jurisdiction, Lieutenant William C. Whittle, who was to be the executive officer of the Shenandoah identified himself to Captain Corbet of the Sea King and immediately took charge of the ship. He set her course for the Madeira Islands. She was carrying officers, a small crew, naval guns, ammunition and stores. A few days later the Sea King rendezvoused with the Laurel at Funchal, Madeira. Commanding officer Lieutenant James Iredell Waddell, supervised transferring the stores from the Laurel to the Sea King and converting the Sea King into a ship of war. The Sea King was commissioned on October 19, 1864, and her name changed to Shenandoah. Despite the nucleus of the crew from the Alabama and other volunteers, Captain Waddell couldn’t muster a full crew. Instead of the normal crew of 150 men, the Shenandoah had a crew of 19 men, including the men in the fire room, the cook and a cabin boy. According to Midshipman Mason, Captain Waddell was discouraged about his skeleton crew, remarking that sailing the seas with such a slim crew was unsafe. He considered trying to recruit sailors from a French or Spanish port, but the crew that he had assured him that they would do whatever they needed to do until he could pick up recruits. Including the captain and doctors, the officers numbered 24. Lieutenant James I. Waddell was a North Carolinian who had served 20 years with the United States Navy and resigned at the beginning of the war to join the Confederacy. Executive officer Lieutenant William C. Whittle, Jr. was a Virginian and had also served before the war. Lieutenant Sidney S. Lee, was the nephew of General Robert E. Lee. Sailing master was Irvine S. Bulloch of Georgia, who had held the same position on the Alabama when she was sunk off Cherbourg. Altogether there were 43 men aboard the Shenandoah and as Midshipman Mason said, "All in the best of spirits, able and willing to do any kind of work required of us." The captain agreed, the anchor was weighed and on October 19, 1864, just eleven days after the Laurel and Sea King left England, the cruise of the Shenandoah began. The purpose of the cruise was to destroy the American whaling fleet in the North Pacific Ocean and the Arctic Sea. On October 29, 1864, the Shenandoah captured her first prize, the bark Alina of Searsport, Maine, loaded with railroad iron and bound from England to Buenos Aires. Ship and cargo were valued at $95,000 and the Shenandoah scuttled her and took her crew aboard as prisoners. The officers of the Shenandoah made it a matter of policy from the beginning to take needed stores for their use, but not to plunder captured vessels. They kept only the ensign or distinguished flag and chronometer of the Alina. Six of the nine member crew of the Alina immediately joined the Shenandoah. Midshipman Mason commented that they were a "most welcome addition to our slender ship’s company." Captain James Waddell didn’t know what to do with his ship, the CSS Shenandoah. Six months after the Civil War ended, he docked her in Liverpool, England. The Shenandoah had been launched in Scotland, fitted out in Madeira where it acquired the remnant of the Alabama crew, and more essential crew members from her first prize, the Alina. During the next few weeks the Shenandoah encountered vessels crossing the equator and made a number of captures. After a few more adventures and prizes the Shenandoah arrived in Australia on January 25, 1865. Captain Waddell anchored safely in Hobson’s Bay, the port of Melbourne and expected to spend only a few days there. The Shenandoah had damaged stern bearings while in the South Atlantic, and the Shenandoah had to stay in Melbourne for repairs. Midshipman John Thomson Mason reported that the colonial authorities readily granted permission to make the repairs, take in coal and provisions and other needed stores. The citizens welcomed the Shenandoah crews with kindness and hospitality. Many people came daily to visit the ship and the decks were so crowded with guests that at the end of the first week, Captain Waddell had to establish visiting hours. The Shenandoah was on the dry dock undergoing repairs to her stern post when pro-Union merchants and colonial authorities attempted to delay her by searching for an imaginary British sailor named Charley. A deserter from the Shenandoah swore that Charley had enlisted on the Shenandoah in Melbourne. A number of police officers and militia surrounded the ship yard and told the owner that he couldn’t launch the Shenandoah and the repairs had to stop. Captain Waddell sent an officer from the Shenandoah with a message that informed the colonial government that the ship would be ready to launch at high tide the next day. If the restraints were continued, Captain Waddell would haul down his flag, pay off his crew, and go home immediately by way of England, leaving the Shenandoah where she was in dry dock. The next day the policemen and militia disappeared. The shaft repairs were finished, and the ship readied for sea. Midshipman Mason noted that of course the Shenandoah had not shipped any men in the port of Melbourne, "and that the story about Charley was a pure invention of the deserter who swore to it." The Shenandoah Leaves Melbourne, Australia with "Stowaways"
Finally, on the morning of February 18, 1865, the Shenandoah weighed anchor and went to sea. Many of the sailors had deserted at Melbourne, so Captain Waddell was again shorthanded. He had enough applications to man the Shenandoah two times over, but he couldn’t enlist men while in British waters. As soon as the Shenandoah passed English jurisdiction, Captain Waddell discovered that there were about 42 "stowaways" of every nation and tongue gathered on deck. One of the "stowaways" was the captain of an English steamer anchored at Melbourne who had given up his command to board the Shenandoah. He was made captain’s clerk. Midshipman Mason noted that "we shipped these men and they made a most welcome accession to our crew." When the Civil War ended in May 1865, the Shenandoah was in the Pacific hunting whalers. The Shenandoah made its last capture on June 28, 1865. That day Captain Waddell took eleven ships, burning nine of them at the same time within a few miles of one another. The Shenandoah sailed on the Bering Straits, the Arctic Ocean, and back into the open Pacific. On August 2, 1865, Captain Waddell spoke to the captain of English bark Barracouta, who informed him of the defeat of the Confederacy. Immediately after leaving the Barracouta, the Shenandoah guns were dismounted and put in the hold for ballast. The port holes were boarded up and all the small arms were stowed away between decks. On November 5, 1865, the Shenandoah reached England, and anchored in the Mersey River on November 6th. The cruise of the Shenandoah ended with her being surrendered to English authorities. The first question the Shenandoah officers asked was about the war in America. Had there been some mistake about the winner? The Englishmen showed the Shenandoah crew a cartoon from Punch. It showed the Shenandoah with Captain Waddell, astride one of his guns, shouting through a huge trumpet to a pilot boat in the distance, "Is Queen Anne dead?" The Shenandoah cruised the world's oceans for 12 months and 17 days, traveled 58,000 miles and sunk or captured 38 ships, mostly whalers. She took more than 20 prizes valued at nearly $1,400,000 or $16,500,000 in 21st century dollars. Captain Waddell took close to 1,000 prisoners. The Shenandoah fired the last shot of the American Civil War at a whaler in waters off the Aleutian Islands. In 1866, the United States Government appropriated the Shenandoah and sold her to the first Sultan of Zanzibar. On April 15, 1872, a hurricane struck Zanzibar and the Shenandoah was blown on shore and seriously damaged. The United States Government filed claims, collectively called the Alabama Claims, against the British Government for building and fostering Confederate blockade runners. In an important development in International Law, the case was tried in a court of arbitration and the United States won substantial damages. The Shenandoah's battle flag is unique among Confederate flags because it was the first and only Confederate flag to be lowered in the Civil War in Liverpool, England, on November 6, 1865. The Shenandoah's battle flag has been in the Museum of the Confederacy in Richmond, Virginia, since 1907. Schooler, Lynn, The Last Shot: The Incredible Story of the C.S.S. Shenandoah and the True Conclusion of the American Civil War, Ecco, 2005. Whittle, Jr. William C. The Voyages of the CSS Shenandoah: A Memorable Cruise, University of Alabama Press, 2005.